(ii) Output: To be able to find constructive improvements of the greater Manchester Strategy that will benefit all. Work up social media. Make people aware of what is going on. Sept-October ’16: Primary input phase. Online – trade off to be made between something quick (e.g. Survey Monkey questions) and opportunities for greater contributions to be made. Process depends on available people with theory and practice experience. 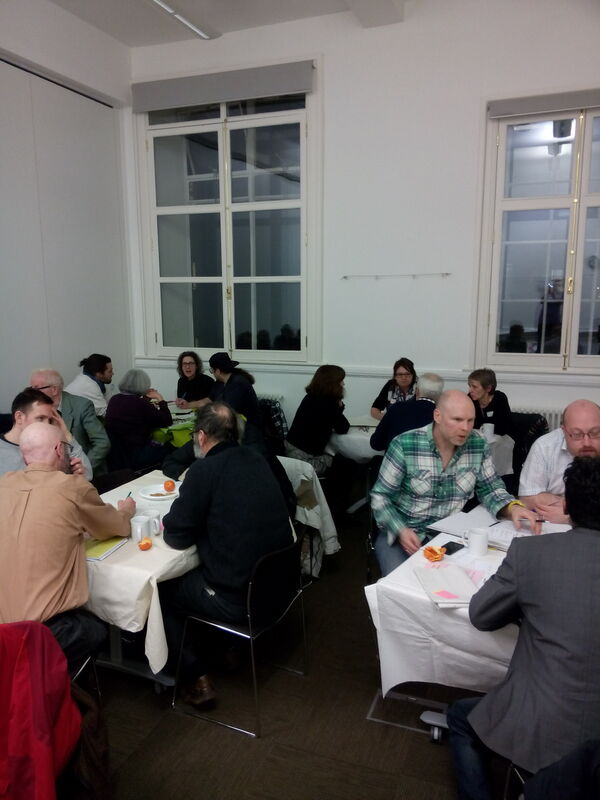 Feeder events – how existing civil society groups might include People’s Planning into their normal core activities and feed data into the planning process. In-workplace opportunities for People’s Plan discussions. November-December ’16: data processing and summarising. Anticipated to be a mixture of Greater Manchester Strategy strategic themes and others to emerge. What can the People’s Plan deliver? Candidates to be presented with People’s Plan and asked to address it in their election campaigns. Overall support was given for the development of a People’s Plan and some offers of involvement were made: further information was needed before other SSM members could commit to active involvement in the process. A statement of principles or values, giving an overall sense of direction for the People’s Plan would be useful form the start, framing a clear statement of invitation to groups and citizens to be involved. It would be useful to have explicit mention of culture (alongside social environmental, economic and democratic dimensions) to the plan. Culture is important both in terms of how the norms and ways we live are represented and how society is reproduced through this representation, and as a useful process of engagement for input to the People’s Plan. Governance: it would be useful to include a stage of endorsement of the Plan – either in its entirety or endorsement of parts of the Plan. SSM could probably mount some Feed sessions providing input into the Plan. More engaging forms of democracy could be an integral part of the plan – and the online resources available could be used for citizen engagement. It will be important that processes of involvement are engaging and varied, relevant to particular groups or areas in order to get a diversity of ideas. It was noted that Greater Manchester does not provide a meaningful source of identity for most citizens even if it does for politicians. This entry was posted in event reports, Greater Manchester City Region and tagged bioregion, democracy, DevoManc, economic justice, Greater Manchester Combined Authority, People's Plan, policy. Bookmark the permalink.